Sometimes tofu gets a bad rep from omnis. But I’m pretty sure that’s because they were eating tofu that wasn’t cooked or seasoned well! I cook with it a lot in the hot for food kitchen. I’ve made cream cheese, eggs benedict, and tofu scramble and that’s just for starters! Try this simple recipe for crispy sweet & sour tofu and prepare to ditch any haterade you were sippin’ on. 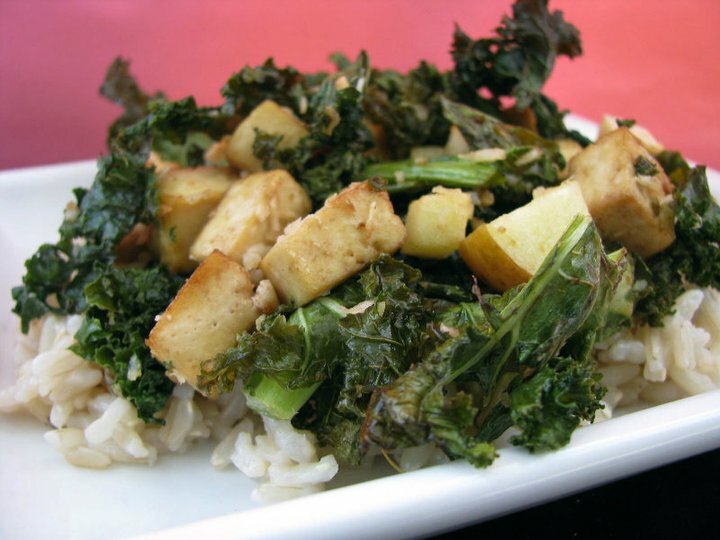 The trick for this dish is to rid it of excess moisture (no one likes soggy tofu!) and fry it up real nice. This recipe also includes has a super irresistible sweet and sour sauce to coat the crispy tofu in. Serve it up on a fresh bed of rice like I did, or on top of some cooked veggies! Bring on the ultimate comfort food… crispy sweet and sour tofu with rice is as simple and easy as it gets! Drain the brick of tofu from the packaging water and cut into bite size cubes. Allow the cubes to sit on a clean tea towel or paper towel to get rid of excess water while you prepare the sauce. To make the sauce, mix cornstarch and water in a small bowl and set aside. In a small saucepan, heat 2 teaspoons of vegetable oil over medium-low heat. Add minced garlic, ginger, and chili pepper flakes. Stir for 30 seconds to 1 minute until fragrant, being careful not to burn the garlic or ginger. Add in the remaining sauce ingredients and whisk together over medium heat until just bubbling. Then whisk in the cornstarch and water mixture. Whisk frequently for 10 to 12 minutes until thickened and reduced. Remove from the heat and set aside while you prepare the crispy tofu. Heat vegetable oil in a heavy bottomed pot to 355°F to 365°F. Prepare the batter by combining rice flour, cornstarch, sea salt, garlic powder, and ground black pepper together in a mixing bowl. Do not add the cold soda water until your frying oil is ready. When you’re ready to fry, stir in soda water to the flour mixture and combine well. If the mixture seems too thin, add a little bit more rice flour and combine. It should be a smooth, slightly thick pancake batter consistency. You want it to stick and coat the cubes of tofu. Place the tofu cubes in the batter and toss to coat evenly. Drop each one at a time in the frying oil delicately. Fry in batches of 5 to 6 pieces and do not overcrowd the pot. Fry for 2 to 2 1/2 minutes. If some stick together, you can gently separate them in the frying oil with a slotted fryer spoon. Remove crispy tofu from the oil with the slotted spoon and let them sit on paper towel to absorb excess oil. Continue this process with remaining tofu cubes. Heat up the sauce again if needed right before serving. In 2 to 3 batches, you can coat the crispy tofu with sauce by adding some sauce to a large bowl and tossing crispy tofu cubes until coated evenly. Serve over rice or vegetables. If you want to bake the tofu, toss the cubes in 2 tablespoons of cornstarch in a large bowl and lay out in an even layer slightly spaced apart on a large parchment lined baking sheet. Bake in a preheated 425°F oven for 30 to 40 minutes until crispy and golden brown. Finish by coating in warm sweet and sour sauce right before serving! hey guys, kinda silly question here…what is soda water? like club soda? I made this and it was delish! I didn’t have any tomato paste so substituted the agave + tomato paste for ketchup and it turned out great! Can I sub all purpose flour for the brown rice flour? Yes. All purpose will always work as it has gluten in it! might be yes. Brown Sugar has more of a molasses-like flavour when cooked down. Agave is more neutral. I didn’t have any so I just made it with about a teaspoon of baking soda and a splash of vinegar. it was so good! Can I use distilled white vinegar instead of rice vinegar? Don’t worry I just used rice vinegar. And I love this so much! Gonna be one of my favorites Thank You! Do I have to use soda water? can you use just plain sugar instead of agave? Thanks for replying. I can’t find agave, but I do have maple syrup, so I’ll try it with that. Thanks again! YUM, Asian-style tofu is the best! This dish pleases everyone in the family! Mentioning tofu in our household used to be met with turned up noses, and groans. Now they know it means yummy! I always double the sauce recipe so that there is some leftover after tossing the tofu. We like to drizzle it on our rice! I made this sauce over tofu tonight and absolutely loved it. I used a different recipe for the tofu since I was air frying it and the overall dish was perfect. 3 C vegetable oil in grams? Is that not a little bit too much? *3 C vegetable oil in ml? You are cooking it in that.Im not sure why you see that as too much. I made this! My thoughts: the sauce was fantastic!!!! Will be making again for sure!!!! The deep fry was an utter fail. Instead I just cut a second bath of tofu into cubes and baked at 425 for 20 minutes. I would rather do these in the oven.. Could I batter them then stick them in the oven? Can’t wait to make these tonight! NOTE: if you want to bake the tofu all you need to do is toss the cubes in 2 tablespoons of cornstarch in a large bowl and lay out in an even layer slightly spaced apart on a large parchment lined baking sheet. Bake in a preheated 425 F oven for 30 to 40 minutes until crispy and golden brown. Then coat in warm sweet and sour sauce right before serving! I’ve made this twice, baking the tofu (adding salt, pepper, and garlic granules to the cornstarch coating), and it’s so good. Ate it with rice and broccoli the first time, and rice and sauteed greens the second. Definitely a go-to recipe! Do you still use the sod’s water if you bake? Or just the corn starch and flour mix? I just made this for dinner and it was delicious! When I was reheating the sauce to stir with the tofu I was worried it wouldn’t be enough, so I just added 1/2C of water and cooked it down a little. It worked out perfectly and I got extra sauce to add to my rice! Thanks Lauren, I’m such a fan! deep frying takes some practice! Just tried the baked-fry version of this and it turned out phenomenally! I added the corn starch, garlic, pepper and salt together in a large bowl then tossed the pressed tofu cubes into it dry rub. On an oiled baking sheet, I baked it at 425 for 35 mins. Results were pure perfection! Thanks for the idea!